Portable detox foot spa. Great price because I really need the space. This product just right there for you. Made of premium material, it is durable and practical. Tall roomy foot bucket to soak your feet and ankles. - Tall roomy foot bucket to soak your feet and ankles. 1 x Foot Soaking Bucket. √ Tall roomy foot bucket to soak your feet and ankles. √ 9" Deep and 3 Gallon Capacity. √ Thick bottom, durable and sturdy. √ Easy to Carry Handle. Color: Green. Material: ABS Plastic. Bath for electrolysis footbath BioEnergiser. Length: 480 mm, width 385 mm, height 125 mm. All prices are incl. It is only in the pan as a spare part, it is not a complete unit! WEEE Reg.Nr DE87951244. Clairol Foot Spa Bath & massage. Hot/Cold Wet/Dry IMMACULATE. Plastic Footbath Foot Massage Round Footbath Barrel Household Foot Tub UK#! NEW ION IONIC DETOX FOOT CLEANSE SPA TUB 5ARRAYS FIR BELT PADS. Ionic Detox Foot Bath Cleanse Spa Machine w Array Tub 10 Liners F Health Care. New Dual Ionic Detox Ion Foot Spa Bath Ion Cleanse 2 Fir Belts Machine 4 Arrays. Size of outside footbath: 50cm × 40cm × 27cm. Arrays × 2. You can choose the suitable detox mode. Through the color that demonstrates, you can understand more about your own health. Main machine include tub × 1. The machine protect inner and outer deeply, detoxify kinds of toxins. Through the color that demonstrates, you can understand more about your own health. People with a pacemaker. Superior foot tub × 1. √ Tall roomy foot bucket to soak your feet and ankles. 1 x Foot Soaking Bucket. √ 9" Deep and 3 Gallon Capacity. √ Easy to Carry Handle. √ Thick bottom, durable and sturdy. Detail Image. Size: Suitable for the tub as the picture. 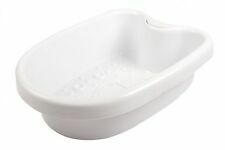 The tub size is about 49cm × 38cm × 15cm. Tub Liners × 100. NEW ION IONIC DETOX FOOT CLEANSE SPA TUB 5ARRAYS FIR BELT PADS. Ionic Detox Foot Bath Cleanse Spa Machine w Array Tub 10 Liners F Health Care. Size of outside footbath: 50cm × 40cm × 27cm. You can choose the suitable detox mode. The purple part of the tub can be removed. You can put the tub liners on the tub easily. Through the color that demonstrates, you can understand more about your own health.